Getty/Portland Press Herald/Derek DavisA child peers up into a voting booth as his mother fills out ballots in Scarborough, Maine. With one month left before the midterm elections, voters have a lot of big decisions to make as they prepare to choose between candidates running for local, state, and national office. 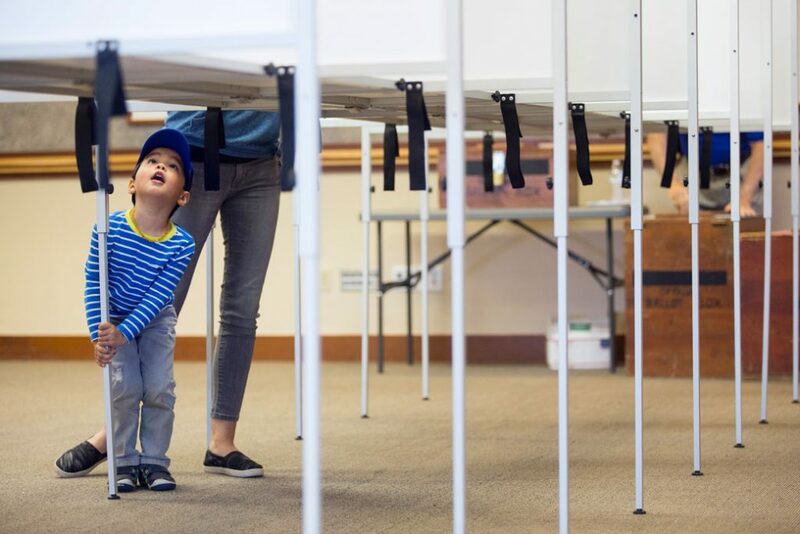 However, November ballots will include more than just choices between elected officials; in at least 35 states, voters will also have to decide whether to accept or reject roughly 150 policy and funding questions in the form of ballot measures. Education is an issue that affects everyone, so it is critical that voters understand these education ballot measures and their potential impacts. In an effort to provide voters with more information on the various education measures that will be on state ballots this November, this column examines two categories of ballot measures: those that center on funding for public education and those that propose significant education policy changes. Ballot measures are roughly defined as questions or proposals on a ballot that voters can either approve or reject. There are many different types of ballot measures, including constitutional amendments, referendums, bond questions, and more. Measures qualify to appear on a ballot through a variety of methods, such as a referral by the state legislature or as the result of a citizen-led petition campaign. Regardless of a measure’s path to the ballot, the results of a vote on the measure serve as a seal of public approval or disapproval of the initiative in question. Although some state legislatures can and have undermined ballot measures with which they disagreed, these measures still serve as an important form of direct democracy, and voters should not overlook them. Public education has suffered a punishing decade, as most states have been slow to return to prerecession investment levels after cutting school funding during the 2008 recession. Ballot measures could help address this underfunding at the state level. This November, measures that could increase revenue for public education fall into two broad categories: tax-based measures and bond-based measures. Tax-based measures recommend changes to the state tax code that would generate a new source of money to direct toward public education. For example, Colorado has a tax-based constitutional amendment on the ballot this year. The measure asks voters to approve or reject an amendment to the Colorado Constitution that would increase state income taxes for people earning more than $150,000 per year; it would also increase the state corporate tax rate to 6 percent. These changes are estimated to generate $1.6 billion in revenue for fiscal year (FY) 2019–2020, all of which would support the state’s newly created Quality Public Education Fund. In total, there are eight tax-based measures on the ballot this November in the following eight states: Colorado, Georgia, Hawaii, Maryland, Missouri, Montana, Oklahoma, and Utah. 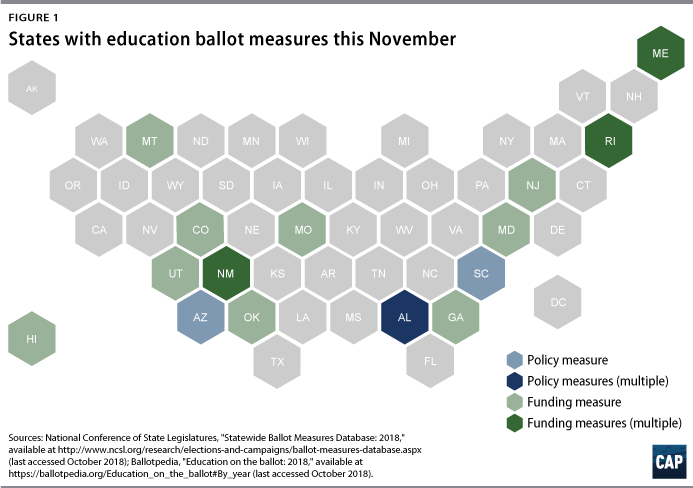 (see Figure 1 and Appendix for a list of specific measures) Based on states’ fiscal analyses, if all measures are approved by voters, they could add an estimated $1.7 billion in revenue toward education in FY 2019–2020. ** (see Table 1 for a breakdown of this revenue total) For reference, this sum is $500 million more than the total annual amount of federal funding for career and technical educational (CTE) programs from FY 2019 through FY 2024. Bond-based measures recommend the issuance of bonds that are expressly intended to be spent on specific education initiatives, such as improving school infrastructure or investing in school libraries. For example, Maine’s ballot includes a bond question that asks voters whether to authorize $15 million in general obligation bonds for the renovation of instructional laboratories, information technology infrastructure, and heating and ventilation systems in Maine’s seven community colleges. In total, there are eight bond-based measures on the ballot this November in the following four states: Maine, New Jersey, New Mexico, and Rhode Island. (see Figure 1 and Appendix) If all eight measures are approved by voters, they could authorize approximately $884 million toward different education initiatives. (see Table 1) For reference, this is more than the total amount appropriated for the upcoming fiscal year to programs that help children with limited English proficiency achieve high levels of academic attainment under Title III, Part A of the Every Students Succeeds Act (ESSA). 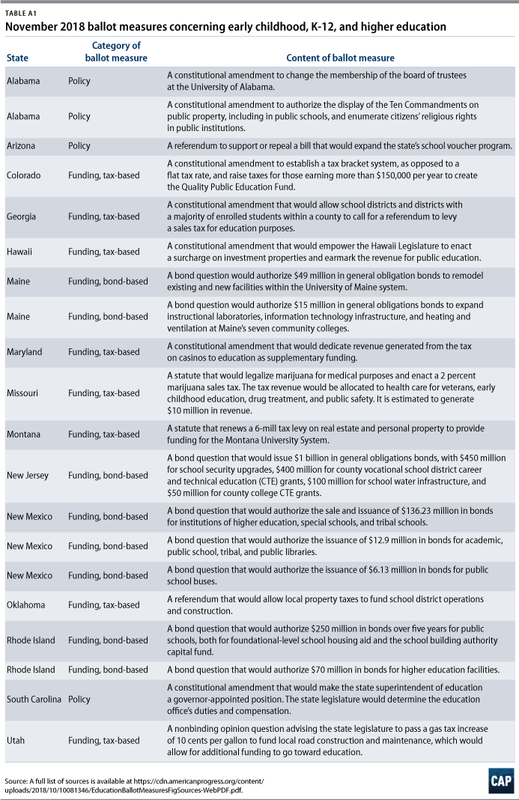 Taken together, these 16 tax- and bond-based funding ballot measures could allot at least $2.6 billion to education—including early childhood, K-12, and higher education—in 12 different states. (see Table 1 for a breakdown of funding numbers) This amount is $500 million more than the total annual federal investment in teachers across the country through Title II, Part A of ESSA. Therefore, as policymakers at all levels of government grapple with the need for investment in public education, voters should not overlook these state-based funding methods. Ballot measures can also serve as public referendums on legislation concerning important education policy issues. Specifically, ballot measures called “veto” or “popular referendum” actually allow voters to repeal existing laws. For example, in Arizona, there is a popular referendum that centers on a contentious state law that, unless repealed, will gradually expand the state’s private school voucher program to all public school students, instead of just to students meeting certain criteria—such as students with disabilities. This expansion of the Empowerment Scholarship Account (ESA) voucher program would divert even more money from underfunded public schools to private schools, with minimal accountability. Opponents of the bill gathered enough signatures to introduce this measure, giving voters an opportunity to stop this expansion and repeal the law through this ballot measure. In addition to repealing current laws, ballot measures can affect policy by amending state constitutions. In South Carolina, voters will approve or reject an amendment to make the position of state superintendent of education a governor-appointed position, rather than an elected one. The South Carolina superintendent of education is responsible for, among other things, managing all public school funds provided by the state and federal government. States across the country sport a variety of methods for selecting a superintendent, and each one has its merits. In any case, the position is too important to ignore this opportunity to weigh in on the shift in selection style. As November rapidly approaches, there is still time for pending measures to make it onto the ballot and for some measures to be struck off. Fortunately for voters, a number of organizations offer resources that help provide understanding of the ballot measures landscape. Ballotpedia, for example, provides a detailed summary of both general and education-specific ballot measures. Additionally, the National Conference of State Legislatures (NCSL) has an easily searchable database of future and past ballot measures, while the Ballot Initiative Strategy Center offers a state-by-state map of general ballot measures. Voting in an election is one of the most important ways for citizens of a democracy to effect change. While it is crucial for voters to examine the stances of candidates on issues, ballot measures offer voters another way to make a difference. From taxes to bonds, governance to vouchers, education is on the ballot this November. Voters should not miss the chance to make their voices heard. Jessica Yin is the special assistant for K-12 Education at the Center for American Progress. Posted in Accountability, Advocacy, Department of Education, Education Budget, Educators Protest, Funding For Education, HBCU's, No Child Left Behind Act, Parents, Retirees, Special Education, Students and Parents Protest, Teacher Evaluation, Teacher Shortage, Technology in the Classroom and tagged "Standing Strong for Public Education", #iBelieve, Accountability, Accountability System, Advocacy, Department of Education, Diversity, Education, Education Funding, English Language Learners, Every Student Succeeds Act (ESSA), Failing, Failing Schools, Federal Education Policy, HBCU, High-Needs Students, NEAExecutiveCommittee, Pension, Pensions, Public Education, School Choice, School Safety, State Budget, Students, Testing and Accountability. Bookmark the permalink.